Arrr ye Mates! So far in P101 Worlds Week we have covered Valencia, Cool Ranch, and Polaris. I wanted to cover Skull Island because I found some very interesting background information about it recently as well as a unique photo. Aside from that, this post has some background on Skull Island as well as tons of amazing concept art. Hop on your ship and let's get sailing in Skull Island because I can guarantee you this is one post you will NOT want to miss. The isles of Skull Island offer much to entice merchants and colonists: exotic fruits, spices, and timber draw high prices in markets across the Spiral, offering a fortune to any captain brave and resourceful enough to ship or smuggle them out. In the deepest jungles, crumbling ruins stand as remnants of a forgotten past. These ruins are the most dangerous places in Skull Island, but also the most tempting - the crumbling temples are adorned with solid gold! Too far from the center of the Spiral for the great powers to exert much control, most of Skull Island is ruled by the Pirates themselves - crews and gangs have taken over failed colonies or built new ramshackle cities of their own: Jonah Town, Flotsam, Scrimshaw, and Skull Island itself, Captain Avery's Pirate capital. The southern Skyways of Skull Island are dominated by Pirates, while the north features two great colonies: the thriving Monquistan city Puerto Mico, and the Marleybonian colony of Port Regal. Monquista owes its entire rise to the gold the Monkeys found in the ancient ruins, while the Dogs of Marleybone work tirelessly to corner the spice market. Their power broken long ago, the Cutthroats still prowl the shipping lanes, making as much trouble as they can, while Wharf Rats smuggle all manner of cargoes in and out of Skull Island, building a huge black market. As I was saying earlier, I came across some very interesting information regarding Skull Island. Did you know that in 1933, Skull Island was actually part of the movie King Kong? Yes, you heard me right. Skull Island originated from King Kong. This was an image of the map used in the movie King Kong (1937) which shows Skull Island. It is home to many beings such as King Kong. I also found another image of Skull Island but from the IPhone/IPad app, "Kong: King of Skull Island". Does it look familiar to you? Maybe because it looks like Skull Island in Pirate101? As you know, there is a giant skull in Skull Island hence the name Skull Island. A while back, Kingsisle released the following image. If you zoomed in on the Skull, it would look like this. I don't know about you but to me, these two versions of Skull Island look very much alike. This led me to think, is this what inspired Kingsisle to come up with Skull Island and it's design? If so, kudos to them because this was an amazing idea! I love how they captured it very well while not copying it exactly. Since we are looking into the amazing concept art by Kingsisle, why not look at more!? Here is some of the magnificent Skull Island concept art created by Kingsisle. What do you think? Do you like all the various artworks? Which is your favorite? 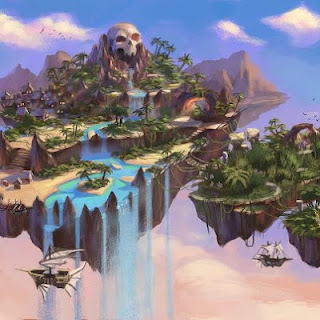 Also, I'd love to hear what you think about the Skull Island from King Kong compared to Skull Island from Pirate101 and your opinion on if that inspired KI to create Skull Island in P101. I hope you all enjoyed playing in Pirate101 today! I love it! Awesome Job! Very nice post! I can't wait for the next P101 Worlds Week!